At first sight, this seems like a promising disc. 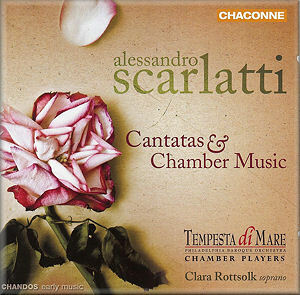 A collection of chamber cantatas and instrumental music by the somewhat neglected Alessandro Scarlatti (father of the more celebrated Domenico), it is well-presented and includes some fine singing and playing by young American performers. But the main problem is the music itself. The four cantatas for solo soprano and instrumental ensemble were composed some time between 1688 and 1725, probably for Scarlatti’s Roman patrons, Cardinals Ottoboni and Pamphili and Prince Ruspoli. Brief and domestic in scale, they provided the composer with the opportunity to experiment with a form of vocal music permitted in a city where opera was banned. To less subtly attuned modern ears, however, these cantatas sound plain, even a little dull. And for listeners acquainted with the dazzle of Vivaldi’s or Handel’s compositions from around the same time, they are deeply disappointing. Take the third cantata on this disc, ‘Quella pace gradita’, for example. A rather droopy, uninspired performance emphasises the dullness of the arias and their rather plain instrumental accompaniment. But all is not lost. The opening aria of ‘Bella, s’io t’amo’ (track 7) has an engaging quality, and it is supplemented by a prominent recorder part which weaves in and out of the vocal line. Soprano Clara Rottsolk does a good job here, as she does in most of the other works. Only in the final aria of ‘Bella, s’io t’amo’ (track 9) does she stumble, with jerky control and a few trip-ups over her Italian diction. The sole instrumental piece on the CD – Scarlatti’s Concerto IX in A minor (tracks 10-14) – is notable for its similarities and differences to Vivaldi and Corelli. Harmonically warm and contrapuntally complex, the concerto consists of several interweaving lines but is stripped bare of virtuosic frills. This gives the work a pleasant freshness on first hearing, but its lack of sparkle counts again many more listenings.